How Can Home Health Care Help a Senior Suffering Pneumonia? Home Health Care Memphis TN – How Can Home Health Care Help a Senior Suffering Pneumonia? A senior suffering from pneumonia needs a tremendous amount of care and support. This infection can be very serious, potentially life-threatening, and because it often comes after a senior has already suffered another illness or infection, such as a cold or the flu, they are likely to be exhausted and experience very challenging symptoms. As their family caregiver you can help them to cope with these symptoms in the ways that are right for them and support their recovery. While there are many ways that you can do this, one of the most effective is to start home health care for them. • Offering companionship and support that will boost their mental and emotional health so they can better focus on healing. If you have been considering ways that you can improve your parent’s quality of life, boost their health and well-being, and support a more fulfilling and active lifestyle as they age in place, now may be the ideal time for you to consider starting home health care for them. 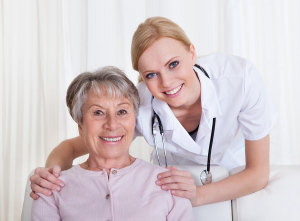 An elderly home health care services provider can create a personalized set of services specifically designed around your parent’s individual needs, challenges, and limitations that helps them to meet these needs in the way that is right for them. This can help your parent to stay healthy, happy, comfortable, and safe, while pursuing greater independence, fulfillment, and activity throughout their later years. When it comes to helping your parent stay healthier, particularly during cold and flu season, this care provider can also help with issues such as encouraging germ control such as handwashing, helping with keeping the home clean, and supporting compliance with doctor guidelines such as meal preparation and medication reminders. For Home Health Care Services in Memphis TN, please contact the caring staff at Personal Care Services MidSouth today! This entry was posted in Challenging Diseases/illnesses/Conditions, Home Health Care Memphis TN and tagged Home Health Care Memphis TN. Bookmark the permalink.